Solomon Joseph Solomon RA (1860-1927) - was the fourth son of Joseph Solomon, a London businessman, and Helena Lichenstadt, the daughter of a cultured family from Vienna. In 1877 Solomon joined the Royal Academy School. Frederick Leighton, the President of the Royal Academy, as well as successful artists such as Millais and Alma Tadema were the role models for young Solomon and his fellow students, Alexander Stanhope Forbes and Arthur Hacker. In 1886 Solomon became a founding member of the New English Art Club - a group of artists who reacted to the restrictive selection policies of the Royal Academy. Other members of the Club were the painters Whistler, Steer and Sickert. Solomon did not carry on exhibiting with the New English Art Club, probably because he was alienated by the outspoken opposition of the Club's leaders to the Royal Academy. 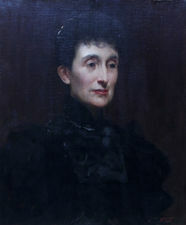 Solomon exhibited in the Royal Academy between 1881 and 1904 and was elected as an Associate of the Royal Academy in 1895 and an Academician in 1906. 'Samson' was painted when Solomon was only 27 years old, in his new studio in Holland Park. At that time Solomon was starting to gain a reputation, especially as a portrait painter. Millais visited the artist in his studio while he was painting Samson and was surprised that such a large picture could be painted in a small studio. 'Samson' caused a stir when exhibited at the Royal Academy and became Solomon's, best known painting.